If you have decided to get a rooftop cargo box for your car in order to free some of the luggage space for other stuff to be carried when you go on vacation and also to carry some longer items that will not fit in your car's luggage space, you don't need to look further than Yakima and Thule which make some of the best cargo boxes available today . An aerodynamic design that reduces drag and noise while driving (the aerodynamic shape pushes air away from the box causing the air to flow smoothly). ABS plastic construction which provides durable rigidity, weatherproofing, and a lightweight body that negates any impact to vehicle fuel efficiency. Dual-sided opening for convenience, and a lid that opens easily and stays open so you can use both hands while loading. No assembly requirement as well as quick & easy installation as long as the car already is equipped with a base rack with crossbars. This article will compare Yakima Skybox and Thule Force rooftop cargo boxes. These were not just the most popular in their category among Amazon customers at the time this article was written, but they had also received excellent reviews from most Amazon buyers (an average of 4.5 stars each out of 5 stars!). Selected Rooftop Cargo Boxes on Amazon. Attention: When loading your cargo box, you should make sure that the total combined weight of your cargo box and its contents does not exceed your rack's weight limit which should normally be specified in your racks user manual. The aerodynamic shape pushes air away from the box causing the air to flow smoothly. Therefore, the box can be left on year-round without a significant increase in noise. The aerodynamic design also reduces the drag and thereby negate any impact to vehicle fuel efficiency. ABS plastic is hard-wearing, weather resistant, and lightweight and therefore is often used for rooftop car cargo boxes. Being lightweight is quite important, because the lighter the box is, the more weight you can put into it, since vehicles can only support a limited amount of weight on their roof. Dual-sided opening for easy access on either side of your vehicle. When the lid is open, built-in lifter or stiffener elements in the box hold the box open providing hands-free access to gear. Yakima Skybox: It provides tool-free installation/removal capability from vehicle. The adjustment knobs are easy to figure out, and it can be securely mounted and centered on the car quite quickly. It is designed with internal lid stiffeners for durability and easy open and close. ​The SuperLatch™ security ensures the lid is secure to its base, and your gear is safe. The Quick-Release mounting hardware fits most crossbars. Thule Force cargo box attaches easily to roof racks via Quick-Grip knob hardware along raised grooves in the floor of the box. The tool-free mounting capability of Quick-Grip hardware, and the range of the box's floor grooves make installation of the box a snap, literally installing in less than 5 minutes in many applications. To install a cargo box on your car, the car’s rooftop must be equipped with a rack system with crossbars. Yakima cargo boxes will fit onto most car rack systems with round, square, and factory crossbars. In most cases, you may not need to buy a new rack, as long as your car already has one. 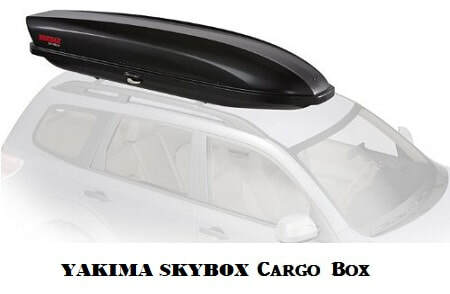 The Yakima Skybox cargo boxes can fit onto crossbars from 24 inch up to 42 inch. 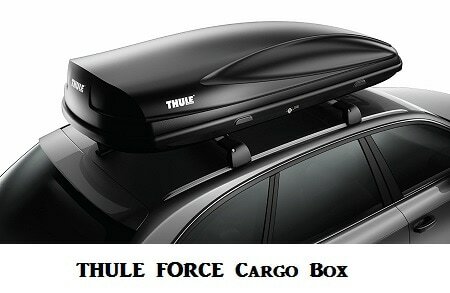 Thule Force cargo boxes are also compatible with most rooftop rack systems coming from the major manufacturers with square, round and factory crossbars. If you don’t already have a rack system on your car, see Amazon section below for Base Rack components available from Yakima and Thule. Before buying a rooftop base rack for your car, make sure you consult your car's user manual or your car dealer to make sure that the base rack you are considering will fit properly your car. Secure locks ensures that all gear is locked and box is properly closed prior to driving. So, which cargo box is best for you? Both rooftop cargo boxes considered here are excellent high quality products that have received raving reviews from Amazon customers. They both come with all the desired features summarized above: they have an aerodynamic design that reduces drag and noise when driving; they are made of hard ABS plastic which provides them with rigidity and durability without being too heavy to have any negative impact on fuel efficiency; they are both waterproof and have dual-sided opening for convenience. And last but not least, they are both very easily and quickly installed without requiring any tools. With Yakima Skybox, though a few users reported that cross winds and wind noise have somewhat affected their drive, most users have not noticed much disturbance unless they were driving at very high speeds! In addition, most users have reported only a slight increase in their fuel consumption with a loss of about 2 to 4 MPG @ 75mph with the box installed (these numbers may vary with the type of car, size of box and amount of loading). With Thule Force there are even fewer complaints as most users have been very happy as far as wind drag, noise and mileage are concerned. Some users who were traveling at speeds of 75mph and even more have reported that they even forgot that the cargo box was up there most of the time. To these people the difference in mph was hardly even noticeable. Since both products are equally praise worthy and come with very similar features, your choice should be based more on the various measurements and weights that are offered by both brands, so you can choose one that fits properly your car and your crossbar rack (for cargo box measurements and weights, please see Note 1 and Note 2 in the above comparison table). Please click thecargo box of your choice below for price information or to purchase. Important Note: Before buying a rooftop base rack for your car (needed to install your cargo box), make sure you consult your car's user manual or your car dealer to make sure that the crossbar rack you are considering will fit properly your car.